Battle is a Digimon's Life"
Matsuda Takato and his digimon Guilmon are looking for a place that Guilmon can live in when Renamon, Makino Ruki's digimon Kicks Guilmon back into a fence in an ambush. Startled, Takato tells Ruki that Guilmon doesn't fight and to stop. Ruki refuses stating digimon are created to fight and orders Renamon to attack. Renamon complies and attacks Guilmon with Kouyousetsu, it fails and Guilmon fires a Fireball at Renamon which misses. Renamon jumps to tackle Guilmon. Guilmon intercepts with a tackle and they both end up rolling around on the ground. Ruki slashes a card through her D-Ark which is Heavy Metal. A cannon appears on Renamon's arm. Renamon points the cannon at Guilmon. Takato tells Guilmon to get away before Renamon kills him. Guilmon listens and returns to Takato. Ruki orders Renamon to keep fighting Guilmon. 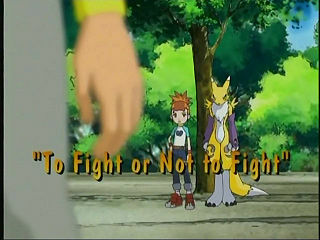 Renamon leaps forward towards Guilmon when Lee Jianliang and his digimon Terriermon interrupt the battle. Ruki leaves and Takato and Lee find Guilmon a place to live and get acquainted. The next day the organization Hypnos is studying the area where Renamon and Guilmon's battle took place. When Takato gets out of school he sees Hypnos's vans and worries about Guilmon. When he checks Guilmon's living area he sees that Guilmon is missing and looks for him eventually finding him. afterwards Guilmon senses a digimon and goes after it. 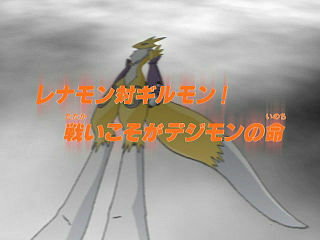 the digimon turns out to be Renamon. Ruki wants Renamon to fight Guilmon, Takato objects but Guilmon and Renamon fight anyway. While they're fighting Lee shows up. Renamon prepares to fire Kouyousetsu at Guilmon when Terriermon runs in the line of fire. Terriermon evolves into Galgomon and starts firing everywhere. Galgomon then points his cannon at Ruki but, Guilmon tackles Galgomon down before anything happens. An Adult evolved from Terriermon. 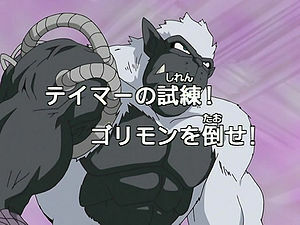 Its Special Move is Gatling Arm. When Renamon fires Kouyousetsu at Terriermon, Terriermon evolves into Galgomon. 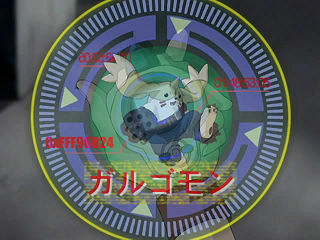 Much of Galgomon's cannon-fire is cut. When Renamon scratches Galgomon's eyes it is cut. 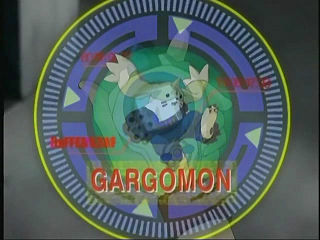 When Galgomon aims his cannon at Ruki, the cannon is edited out. This page was last modified on 3 December 2016, at 20:27.